After trying to conceive a child naturally for nearly four years, we carried out an IVF cycle in April this year. We were over the moon that it had worked first time and we became pregnant. However, in July, when I was 12 weeks and 2 days pregnant and just starting to feel ‘safe’, I started to bleed heavily in the middle of the night and my husband rushed me to A & E. I was sent up onto a ward to be monitored and after they sent my husband home to return later during visiting hours, I miscarried alone in the hospital bathroom. Although the hospital gave me pain relief, I was essentially left alone to deal with the emotional side of what had just happened and to that end I was offered no advice or support from the doctors and nurses- instead being given statistics and told that miscarriages were very common. The overwhelming emptiness and emotional pain after losing a child is nothing that can be explained with words or prepared for and certainly not helped with statistics! However, I was thankful that I could access the internet for the 48 hours I was in hospital and so I passed the time reading other people’s stories about miscarriage and their experiences and feelings. In doing so, I came across the Miscarriage Association’s website and some of the information that I read there was invaluable. In my emotional state, I would never have thought to ask the doctors some of the questions such as ‘What will happen to my baby’s body?’ etc. if I had not read their site. I was also thankful that we hadn’t kept our successful pregnancy test a secret, as it was those people who knew that we were pregnant that rallied round to support us with an overwhelming amount of love. Although that can never bring our child back, it certainly helped us to have the support of friends and family rather than keep our miscarriage a covered up secret. Although we would never find out the gender of our child, both my husband and I had dreamt of a baby girl numerous times whilst I was pregnant so we named our little girl Ellie. I wanted to do something in her memory and also to break the silence and taboo surrounding pregnancy loss. To this end, I decided to run a 10k in memory of her and to raise funds and awareness for the Miscarriage Association. On the day, I felt really emotional and like our baby was really looking down on me and I really wanted to make her proud. 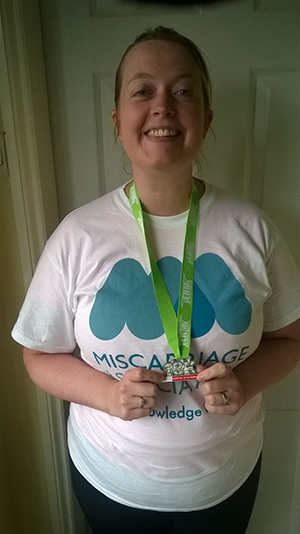 I completed the race, raising £260 in total and in doing so, I was also astounded by the amount of people who got in touch with me with stories about their own losses and experiences of miscarriage. We have now started our second IVF cycle and although I will never ever forget our baby girl Ellie, we are hoping that we will successfully make her a little rainbow brother or sister very soon.